WELLINGTON, Fla. - A Florida landscaper has been charged with animal cruelty after authorities say he ran over a mother duck and her 11 ducklings with his riding lawnmower. The South Florida Sun Sentinel reports that police arrested 24-year-old Jason Falbo of Royal Palm Beach on Wednesday. He's charged with nine counts of animal cruelty. 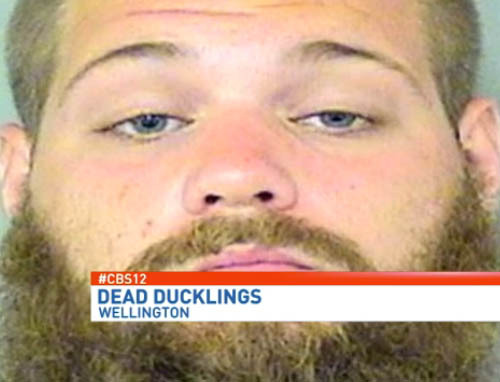 Authorities say he mowed down the ducks May 2 at the home of a family caring for them in Wellington. The family says the ducklings were a few days old. Boyd Jentzsch says his family, including his 7-year-old son, watched from inside their home, screaming as the ducks were run over. Police say nine ducklings died. The mother and two ducklings survived. Falbo is being held at the Palm Beach County Jail on $27,000 bail.